This long-awaited autobiography is more about the political than the personal. BELIEVE it or not, Tun Dr Mahathir Mohamad has been a part of Malaysian politics since World War II. Thus, his long-awaited memoirs easily drives home the fact that his influence runs deep and continues unabated, over 60 years later. Not one to shy away from controversial views, he expressed grave disappointment with every one of Malaysia’s prime ministers and deputy prime ministers, barring Tun Abdul Razak Hussein. Studying his words, one also sees that Mahathir was often in conflict with himself, for example when denying the key role he must have played in many failures and controversies. He is also known for his willingness to do whatever it took to remain in power once he had reached the pinnacle in 1981. His deputies never had an easy time, and all of them fell by the wayside. Not even Tun Abdullah Ahmad Badawi, despite being the only one to reach the position of prime minister, could remain safe from Mahathir’s assailment. The stamp of ownership Dr M put on Malaysian nation building is undeniable, and no one today doubts that both the good and the bad from his long period of dominance will continue for quite some time yet. His 22 years in power were controversial ones, during which scandals broke one after the other, and opponents were at times arrested without trial. The latter actions, he now claims, were against his will. But his tenure was also the time when Malaysia gained global prominence, not only as an economic wonder and a showcase for “moderate” Islam but also as a multiracial society that posed as champion of the South and the Muslim world as well. However, after he stepped down in October 2003, the long-term effects of his method of nation building have become obvious. Institutional degradation threatens to be his lasting legacy, and the establishments ruined in his time include Umno itself. One can thus understand that his memoirs was eagerly expected. Many wish to know how he perceives his own achievements, and even more want to see some regret. Now that he is no longer a politician, can he exercise enough distance from his own past to achieve a credible narration of his life and achievements? Doctor In The House, stretching over 800 pages, varies in style. It varies in depth as well, with some subjects studied much more at length and in detail than others. Taking too long to finish a book has many drawbacks, the chief of which is that the parts will not gel well, making the final product feel like a collection of chapters written by different people. It does not help that Dr M dwells excessively on the chapters that are lessons in official history and not biographical. I was certainly left wishing that he had had expert help or that he had listened more to whatever expert help he may have had when finishing the book. reference to a bygone polity and not a term used by early anthropologists. Mahathir’s potential for controversy was obvious already when he began publishing articles in The Sunday Times after the war. His first piece saw the light of day on July 20, 1947. It was about Malay women empowering themselves, and about how their “fervent nationalism and sympathetic understanding” actually inspired their men to struggle for their own survival. This view on women is one of the more commendable aspects of Mahathir (page 235), as is his affection and respect for his wife, Dr Siti Hasmah, and his joy in fatherhood. Some of his passing memories are amusing to read as well, and I am sure they bring a recognising smile to older Malaysians the way Lat’s cartoons do; by capturing passing pedestrian scenes that otherwise remain outside description. Most other areas that he draws attention to are done in a much less amiable fashion. The issue of race, a 19th century notion that most social scientists today find well nigh impossible to define, let alone use, is not a problem for Dr Mahathir. And he does realise that much of what he had to say can be construed as racist or narcissistic (page 24). But although that is not his stated intention, I have to say that the fervent and categorical use of “race” is disturbing and certainly makes his book unnecessarily racialist, if not racist. Some narcissism is apparent when he exaggerates his role in the resistance against the Malay Union (pages 92-95) or when he claims that after his expulsion from Umno, “no one else was championing the cause of the Malays” (page 210). He is probably right when complaining that he became persona non grata after Tunku Abdul Rahman kicked him out of Umno in 1970, but to be flabbergasted and to protest as avidly against being ignored after his retirement in 2003 is surely unjustified (pages 210, 243). “Successors, even if they are of the same party, do not wish the people to remember their predecessors. Many try in different ways to obliterate memories of the recent past. This is easy if the predecessor is disgraced, yet even if the predecessor willingly surrenders power, a successor may be uncomfortable if he is remembered too kindly (page188). The lack of a serious class analysis in the book is disturbing, as is Dr M’s tendency to place blame on others in analysing history. He accuses the British of being unfair in devaluing the pound sterling without first telling Malaysia about it (page 189). But currency devaluations do not work unless they come as surprises; that is how capitalist finance is played. And accusing voters of being vindictive when not supporting him in 1969 also shows a warped understanding of what popular will and democracy is (page 196). 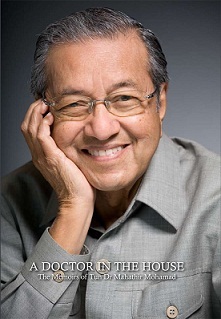 Dr Mahathir claims that Umno was being magnanimous in not playing racialism to the hilt when they cooperated with non-Malays back in the 1950s instead of embracing the Islamist splinter group, PAS, thus forgetting in the process that independence would not have been impossible otherwise (page 222). Here, the myth of complete Malay unity as a default situation looms large despite the evidence. Umno’s subsequent weakness is blamed on non-Malay demands and not on the obvious reality that, for most people, ethnicity-based dominance is not always the paramount consideration in politics. Other dimensions such as inter-personal conflicts, profession, class, gender, education and urbanity, not to mention an endless array of historical circumstances, are equally relevant. Needless to say, PAS is also blamed for being betrayers of the Malay cause (page 223), while Datuk Onn Ja’afar is not judged the same way despite his departure from Umno and his forming of alternative parties. The Malays as such are also blamed. Shortcomings in the New Economic Policy are not blamed on the state and its administrators but on the greed and poor money management of the individual Malay (pages 232, 267). But in presenting half truths, selective recollections and opportunistic rationale, Dr Mahathir’s book fails to bring greater understanding to his time in history.